Stand up to some of the most destructive forces in nature with a hardened structure expressly designed to resist high winds and flying debris. Hurricane Sandy served as a stark reminder that in every part of the country, severe storms pose a grave threat. To give your family near-absolute protection against hurricanes and tornadoes, consider setting up a dedicated safe room. While commercially constructed units are commonly available, numerous DIY options exist for those ambitious enough to build their own. The Federal Emergency Management Agency (FEMA) provides comprehensive construction specifications. If you live beyond flood range, you can put the fortified room in your basement, but if you are in either a flood zone or a storm surge zone, choose an interior space on the ground floor. 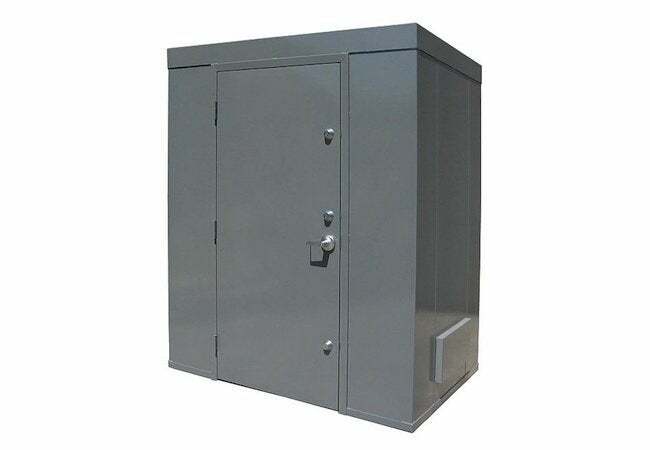 If possible, your safe room should be securely anchored to a concrete foundation, and its walls, ceiling, and door should all be able to withstand winds up to 250 miles per hour. Perhaps needless to say, there are no windows, and the door must open inward, in case debris blocks the way. For ventilation, provide a small opening to the outside, and to increase airflow, use a battery operated fans. Both FEMA and the Red Cross offer detailed information on everything else that it’s wise to stock in your shelter.